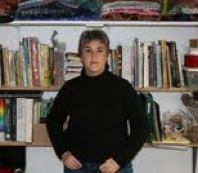 Lorrie Fredette lives and works in New York’s Hudson Valley region. She is a 2009 recipient of an artistic residency at Women’s Studio Workshop. Her most recent solo show was at The Gallery at R&F, Kingston, NY. Her numerous exhibitions include “The Importance of Not Seeing Clearly” at CAP ArtSpace, Ithaca, NY and “Shades of White” at Surprenant Art & Design, Kingston, NY. Fredette was honored with a New York Foundation for the Arts SOS Grant in 2007. Public collections include Jyväskylän Taidemuseo in Jyväskylä, Finland and The Gift Project. She is currently working on “Extracting (in) Formation” a site-specific installation inspired by Swine, Avian and Spanish flus for Gallery Ehva of Provincetown, MA in the summer of 2010.